This is my 4th illustrated book, with mostly words instead of a picture book. 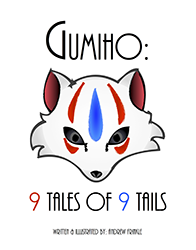 This 6x9 inch full black and white illustrated novella features a collection of 9 short stories about a Gumiho. This is an Asian fox spirit. She is born as a fox without a tail, and as she learns many lessons, she grows tails and gains powers. What will her destiny be after growing all 9?